Multi Wheel Roulette And 3 New Slots At All Slots And 32Red Casinos. Spin New Multi-Wheel Roulette And Three New Video Slots At All Slots And 32Red Online Casinos. Microgaming has just added unique Multi-Wheel Roulette and three new slot machines to the portfolio of over 450 games. In February new online casino games evoke Valentine's Day passion and excitement with Sneak a Peek: Planet Exotica, Rhyming Reels: Queen of Hearts and Ruby of the Nile slots. You can spin new roulette and slot machines at All Slots, All Jackpots or 32Red Casinos. Play up to 8 roulette wheels at once on this brand-new table game! Now you have the opportunity to bet on eight wheels at once! This Gold Series game brings the sophistication you demand, with the additional option to place Call Bets on the table! One glance at Multi Wheel Roulette at an Online Casino will tell you that you're playing an another top-drawer Gold Series roulette game. This latest addition allows mixed chip piles and presents the player with a maximum of 8 wheels with which to play. 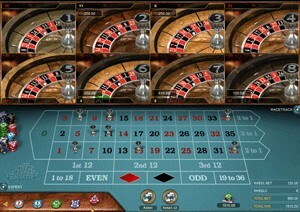 There is a single betting table; each bet placed is multiplied by the number of wheels chosen. Call Bets are also catered for in the game. These are a group of pre-named and pre-determined bets, equivalent to bets that are normally shouted out in a land-based casino for the dealer to place. You can choose to place one or multiple Call Bets on the roulette table. Enjoy the precise graphics and crystal clear digital sound effects of Multi Wheel Roulette. It's time to download the 32Red Casino now to enhance your Roulette action. New players can claim £/$32 free for every £/$20 deposited, up to a maximum bonus of £/$160 free (160% match). Try the fabulous addition to the Gold Series of games and claim a fabulous casino welcome bonus to boost your winnings. Claim your 100% match signup bonus, up to 200 credits in currency, with your first deposit at All Slots Casino. Players are also given 10% cash back on every purchase, up to 450 bonus credits per month, each month! This means you can receive over 5,000 bonus credits a year! New ClearPlay Bonus System allows you to withdraw the cash that you've deposited with no wagering requirements, no strings attached. In this way, players at the casino are free to both enjoy their bonuses and access their money.